Nick Power was painting his stairs in Hoylake when I called. No big moves to London or even Liverpool for The Coral, it seems, the band still happy with life on the Wirral 22 years after they emerged. In fact, they never moved away, even at their commercial peak around the time of second LP, Magic and Medicine, a 2003 UK No.1 and one of nine top-20 albums in all. 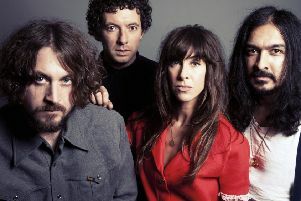 Last month their latest record for Ignition, Move Through the Dawn– recorded at Liverpool’s Parr Street Studios and produced by the band with Rich Turvey – peaked at No.14 in the UK, seen as the next chapter in the story of ‘The Coral Reborn’, having taken five years out after 2010’s Butterfly House. They returned, recharged, with 2016’s psychedelic, riff-heavy Distance Inbetween, but now they’re back with something showing their pop potential again. The first few tracks aired from the new LP – ‘Sweet Release’, ‘Eyes Like Pearls’, ‘After the Fair’ and ‘Reaching Out for a Friend’ – certainly impress. They still know how to write great songs. “That’s what we try to do. The album that preceded didn’t have anything on it like that. We wanted to do something like Pink Floyd or Hawkwind. People were probably expecting us to do that again. They’ve always had their quirky moments, but also out-and-out timeless pop like 2003’s ‘Pass It On’. They cite Phil Spector’s ‘70s ‘big sound’ with The Ramones and Dion as influences this time, plus early Bob Marley, ELO, even the Traveling Wilburys, ‘back to pure melody’. Ian Skelly (drums) and Paul Duffy (bass) were practising in school in 1996, lead guitarist Bill Ryder-Jones, Ian’s older brother James Skelly, and rhythm guitarist Lee Southall soon joining, Nick in two years later. He sat in on ‘praccies’ while in another band before, the lads swapping classrooms and bedrooms for locations like the basement of Hoylake pub Flat Foot Sam’s, and soon they reached the Liverpool circuit. That included a Sunday afternoon Cavern residency, ‘three gigs a day to three Japanese tourists’, before Alan Wills offered to manage them, forming the Deltasonic label around them, the big time beckoning. “He was even an outsider on the Liverpool scene, with massive enthusiasm and really strong opinions. Outsiders like that are the visionaries and have nothing to lose. It’s now 20 years since Nick – also guitar, organ, piano, melodica, harmonica, vocals, lyrics – joined. They remain far removed from the heritage circuit, though, still going for the unexpected, and off-kilter. During the band’s hiatus, Nick concentrated on his writing, including poetry, and his latest book – Into the Void, a first-hand account of the recording, release and touring of Distance Inbetween and life in The Coral after that five-year break, was published alongside the new LP. Did the band’s initial success come too soon to properly enjoy it? “Yeah, we were all just teenagers and had to become adults in the midst of it all. We never had a great infrastructure for touring. It was wild. Other young bands are really organised. We did it so ramshackle. “We were so young and hungry, didn’t question anything. But by our mid-20s we thought, ‘What are we doing this for?’ Everyone was spreading their wings, hanging out with other artists, getting a different perspective. I’m not sure if it’s just geography, but The Coral definitely carry a Merseyside sound, and not just as Ian Broudie co-produced four of their albums. “I’m massively into the theory of geography and how it affects music. It’s psychogeography almost, the way it influences you. The thing about us and Liverpool bands, it’s in your blood, the way you construct or sing a melody, the product of living by docks and freighters, all that. The Coral’s forthcoming eight-show UK run ends at Liverpool University’s Mountford Hall (Friday, October 12) and Manchester’s Albert Hall (Saturday, October 13). For ticket details and more about Move Through the Dawn, go to www.thecoral.co.uk and keep in touch via Facebook at https://www.facebook.com/TheCoral/, and Twitter at https://twitter.com/thecoralband/.